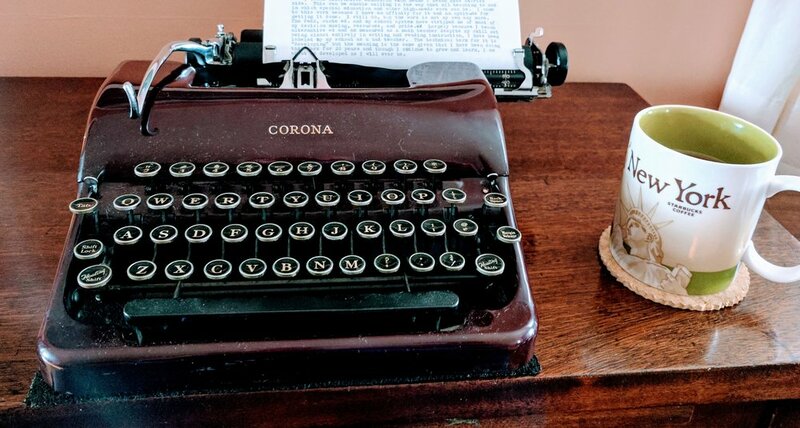 My first typewriter, the 1938 Corona Sterling is the most beautiful machine I know. From the curved lines of the burgundy case to the glass keys, it is stunning. It arrived on the first anniversary of my father's death two years ago. He too was manufactured here in Syracuse, NY in 1938 and every time I type on the machine it evokes the happy memory of him. No machine can top that. Knowing that I would need to send the Sterling out for service and a new rubber platen but not wanting to be without a typewriter, I found a 1951 Smith Corona Silent on eBay. The pictures looked good, the price was right, and the seller rated well. When it arrived, the machine was in excellent shape, but I wasn't thrilled. The elite font and general character of the letters on the page weren't right. Unlike the Sterling, the Silent was not love at first type. Within a week of buying the Silent, a 1971 Olympia SM-9 appeared on Craigslist. The seller lived an hour away. The price was too low, but I went for a drive and found a beautiful machine with a problem carriage return that could be easily fixed. I paid the seller full price after encouraging her to take more. No, she said, I want it to go to someone who will use it. I have used it for sure. The action on it is spectacular and the font is gorgeous. For a year the Silent has been, well, silent. That has bothered me. So too has the feeling that owning three typewriters has me leaning toward collecting typewriters, something I don't even want to get into. I can't afford such things and don't want to be weighed down by too many possessions. This is why, when a friend mentioned that his daughter wanted a typewriter for her birthday, I made him a good offer and sent the Silent away. I typed a note to her explaining the care and feeding of the machine. That's the last I'll ever type on it. She may or may not join the typosphere. The Silent may be more decoration that writing tool, though I challenged her to type at least one school assignment on it. What she does with it is her decision. Forgive me, but I'm a happy two-typewriter man now. I understand the lure of collecting typewriters and respect those who do, but I'm a heretic when it comes to all that. I don't want to collect; I want to write. Two typewriters are more than enough for me to type on and on and on.